I pore over cookbooks in my 30s the way I once devoured fashion magazines in my teens. The pictures aren’t usually as interesting but the content is much more useful. Not that I don’t appreciate knowing when leopard print is in and heavy eyeliner is out, but style changes so much that it’s hard to keep up with. I prefer to spend my time thinking of something fabulous to cook than fabulous to wear. Luckily, I’m not alone. Much to my delight, I’ve noticed that most of my friends have food magazines or cookbooks stashed around the house. I found this recipe while hanging out with Leah (you may remember her rigatoni with pork and lemon ragu or tzatziki chicken with couscous and hummus). Maybe it’s because she also has a food blog, or maybe she was too nice to make fun of me, but she didn’t bat an eye when I asked her for pen and paper and transcribed this pantry staple‐based recipe over a glass of beer. I guess this is adulthood. My fridge is never without a bag of Trader Joe’s toasted, sliced almonds. They are perfect for throwing into a bowl of oatmeal, on top of brownies, or in a pasta dish like this one. The few extra cents I pay to buy them pre‐toasted saves me toasting and cooling time (not to mention the aggravation of an extra pan to wash). Cook the spaghetti al dente in a large pot of boiling, salted water according to package directions. While the pasta cooks, process the red peppers, cheese, almonds, basil, garlic, and lemon juice in a food processor until smooth. With the motor running, slowly add the olive oil until it is incorporated. Season the pesto well with salt and pepper. 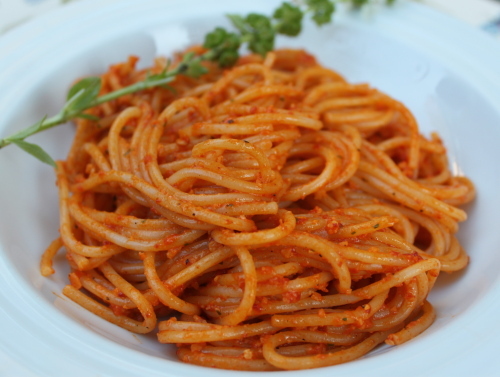 Drain the spaghetti, reserving 1/2 cup (125 ml) of cooking water. Return the spaghetti to the pot. Add the pesto to the spaghetti and toss to combine, adding reserved pasta water as needed. Season with salt and pepper and serve with additional grated Parmesan, if desired.